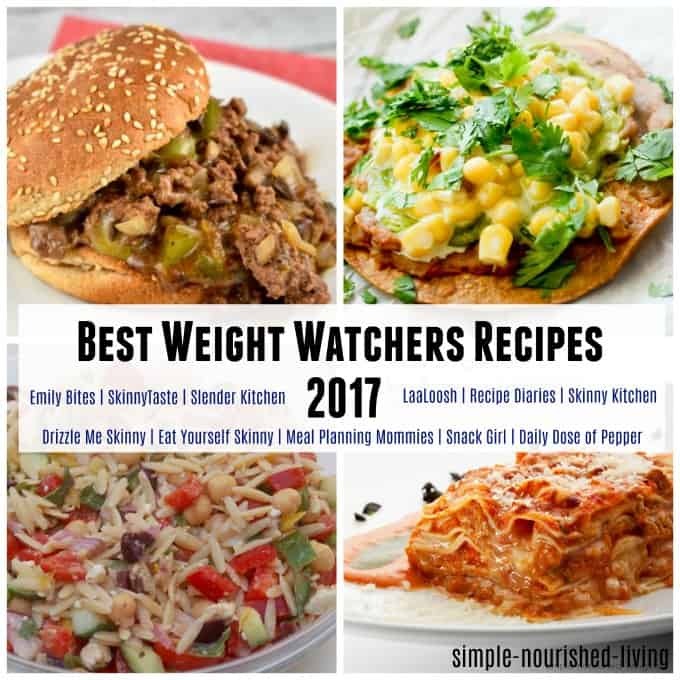 Last year I compiled a list of what I thought were the Best Weight Watchers Recipes from my favorite Weight Watchers friendly recipe sites that was hugely successful. So I decided to play it again…. I toured the web to visit all my favorite Weight Watchers friendly sites – Emily Bites, Slender Kitchen, SkinnyTaste, Snack Girl, Recipe-Diaries, Drizzle Me Skinny, Eat Yourself Skinny, Meal Planning Mommies and Daily Dose of Pepper – and am delighted to report that it was another delectable year for Weight Watchers friendly recipes. 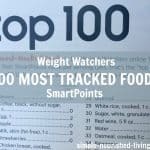 I’ve compiled what I feel to be the Top Weight Watchers Recipes of the Year – 2017. There is nothing objective about this list! 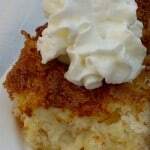 It reflects the kinds of foods and flavors I am most drawn to and the kinds of Weight Watchers recipes I like to make. All the recipes have Smart Points, and many also include Points Plus as well as nutritional information. This year I’ve organized the recipes by site. Enjoy! 4-Ingredient Flourless Banana Nut Pancakes – Made with only FOUR ingredients, perfect to make anytime you need to whip up a quick breakfast, and a perfect way to use up those ripe bananas. Easy Enchiladas Verdes (Green Enchiladas) – Traditional Mexican green chicken enchiladas, made lighter. To make these even easier, I would substitute rotisserie chicken for the poached chicken breasts. Instant Pot Picadillo – A family favorite, Picadillo that is easy to make and great over rice, in tacos and more. One Pot Chicken Fajita Pasta – A Mexican-inspired pasta dish… Chicken fajitas meets pasta night! 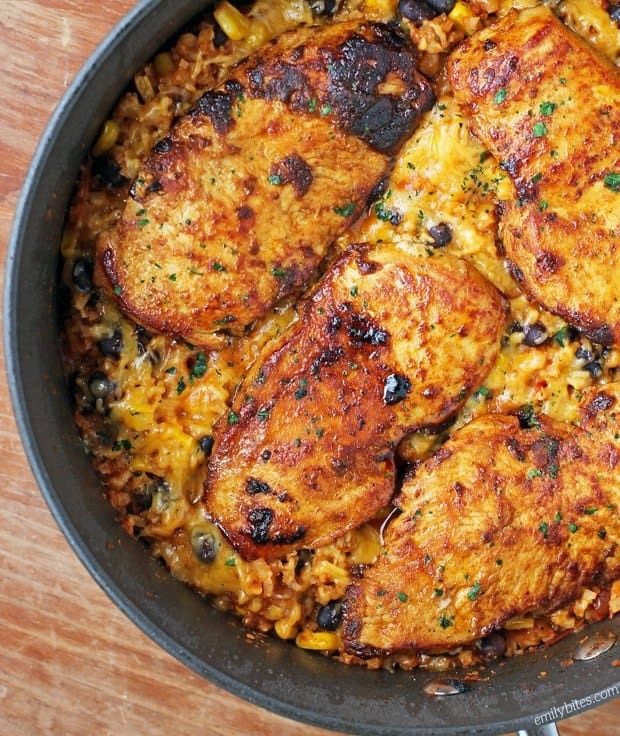 This easy chicken dinner is made in one pot, for an easy dinner ready in under 30 minutes! Un-Stuffed Cabbage Bowls – Quick and easy stuffed cabbage – without all the work! Cajun Shrimp in Foil – Spicy shrimp seasoned with Cajun spices, Andouille sausage, and rainbow colored vegetables are baked together in foil pouches. They are fast and easy to make, and can be made ahead and kept in your freezer. When you’re ready to cook them, just pop them in the oven – perfect for busy weeknights! Grilled Chicken Bruschetta – Made with juicy tomatoes, mozzarella, basil, red onion, garlic and balsamic, this easy recipe turns plain grilled chicken into a delicious weeknight meal in minutes. Chicken Marsala Meatballs – These Chicken Marsala Meatballs are a fun twist in the classic dish! Great served over butternut squash or egg noodles. Chicken Pesto Bake – A simple, light dish made with skinless chicken breasts, pesto, tomatoes, mozzarella and Parmesan cheese. You can make this in the oven, or make it outside on the grill! Sheet Pan Shrimp with Broccolini and Tomatoes – A quick and EASY low-carb dish with tons of flavor, ready in under 3o minutes start to finish. Sheet Pan Balsamic Herb Chicken and Vegetables – This easy, 30 minute sheet-pan dinner is loaded with vegetables and seasoned with balsamic and herbs. Delightfully Baked Apples – Baked apples topped with oats, cinnamon and a touch of brown sugar. Easy to make and perfectly portion-controlled. Serve a la mode for an extra special treat! 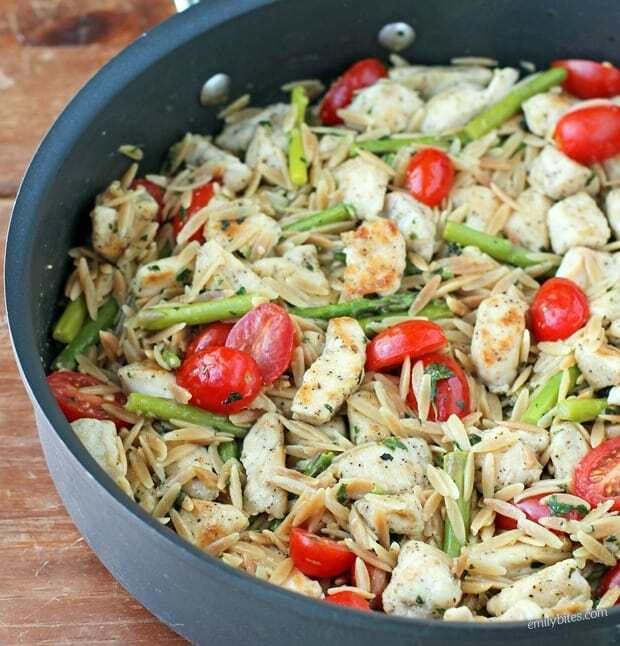 Lemon Chicken Orzo with Tomatoes and Asparagus – This pasta dish is an easy, one-pot recipe that tastes bright, fresh and perfect for Spring or Summer. Mexican Chicken Cauliflower Rice Skillet – This Mexican Chicken Cauliflower Rice Skillet is a healthy, flavorful one-pot meal that’s perfect for a weeknight dinner! 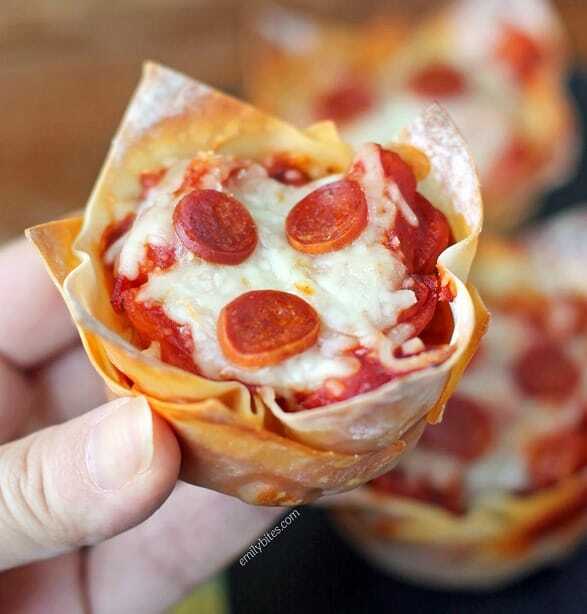 Pizza Wonton Cups – With spicy sausage and pepperoni, along with customizable fruit or vegetable topping of your choice, I think you’ll find these are full of flavor. 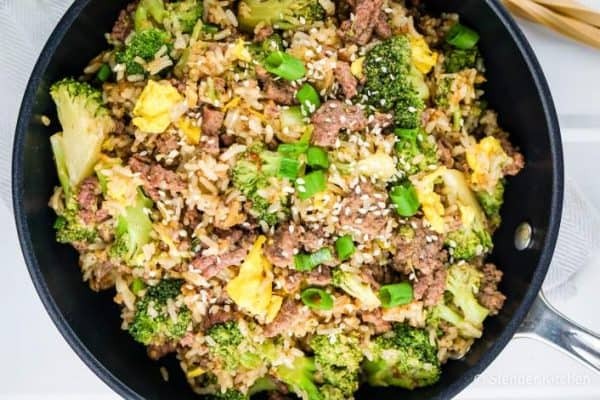 Beef & Broccoli Fried Rice – Beef and Broccoli Fried Rice takes all the flavors or your favorite Beef and Broccoli take-out dish but is made in one skillet with ground beef for an easy to make, 20 minute dinner your family will love. 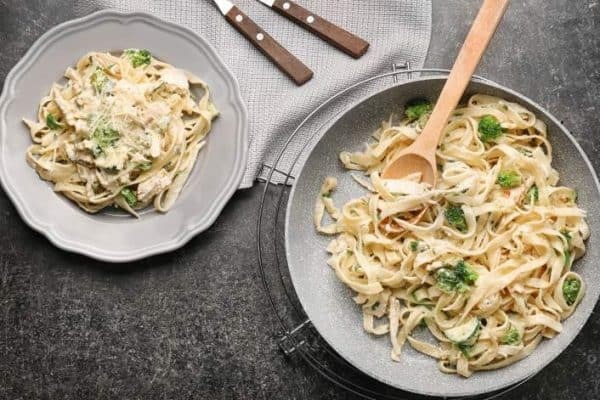 Creamy Chicken & Broccoli Pasta – Creamy Chicken and Broccoli Pasta is a healthier version of your favorite restaurant dish with the most delicious creamy Parmesan sauce, fresh broccoli, chicken, and a touch of lemon. Its comforting, filling, and has about half the calories of the restaurant version. 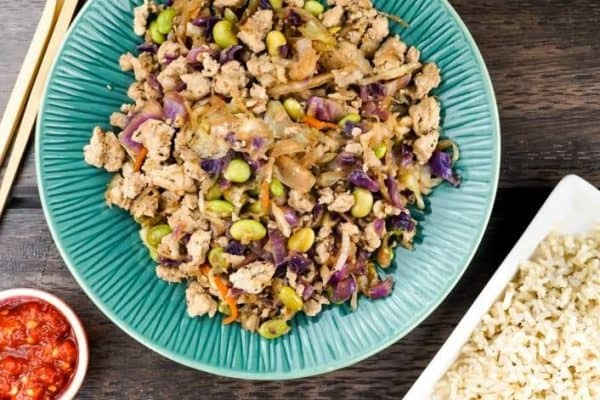 Egg Roll Bowl – Egg Roll Bowls have all the flavors of your favorite Chinese dish but are made without the deep fried wrapper for a healthier, delicious twist on this classic recipe. Healthy Greek Nachos – Healthy Greek Nachos are quickly becoming a staple in our house, especially now that the weather is heating up and I want something fresh and light. In full disclosure, I have eaten these three times for lunch already this week. I am slightly obsessed but they are just so good. Crispy Flatout chips covered in cucumbers, tomatoes, chicken, parsley, mint, lemon juice, black olives, and tons of creamy, salty feta cheese. 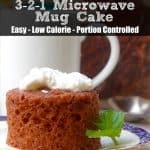 Plus the recipe is just 346 calories. 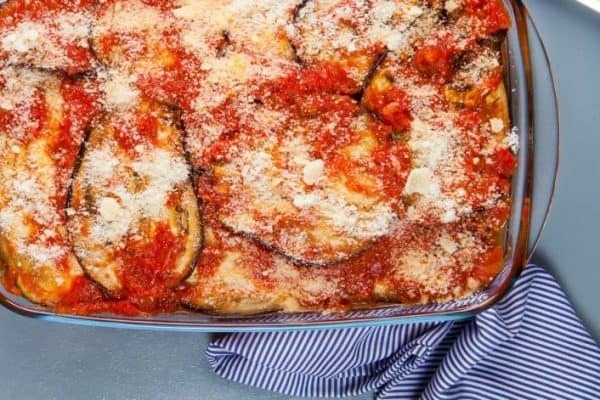 Low Carb Eggplant Parmesan – Low Carb Eggplant Parmesan takes the classic Italian dish but lightens it up to be a lower carb version that is packed with just as much flavor and all the saucy, cheesy goodness you expect in a good eggplant parm. One Pan Shrimp Fajitas – One Pan Shrimp Fajitas have all the flavor of your favorite restaurant dish but our made at home in under 15 minutes with all natural ingredients and an amazing homemade fajita seasoning. One Pot Caprese Pasta – One Pot Caprese Pasta takes all the amazing flavors of a Caprese salad – fresh tomatoes, basil, mozzarella, and balsamic vinegar, and combines them in a delicious, twenty minute pasta dish! 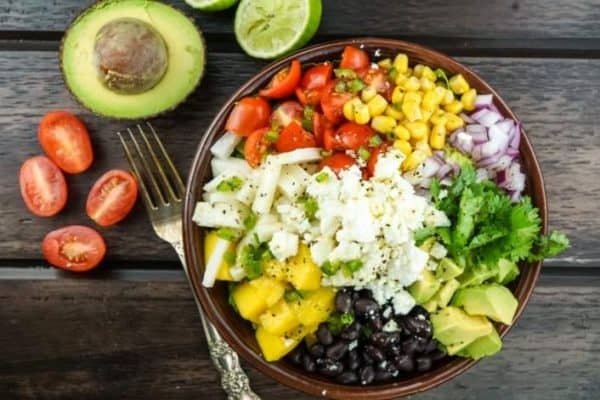 Mexican Chopped Salad with Honey Lime Dressing – Mexican Chopped Salad with Lime Vinaigrette is the perfect meal sized salad filled with all your favorites – black beans, corn, avocado, tomatoes, mango, jicama, cilantro, red onion, queso fresco, and a quick and easy honey lime dressing you will want to put on everything. 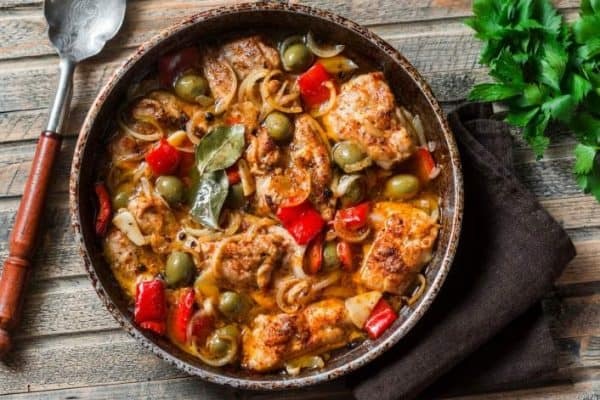 Slow Cooker Mediterranean Chicken – Slow Cooker Mediterranean Chicken cooks low and slow in the crockpot to create an amazing dish packed with moist chicken thighs, olives, red peppers, onion, Italian spices, capers, and plenty of flavor. 2-Ingredient Disney Dole Whip – You don’t have to fly to Orlando, book a resort, drag your children to Disney World simply to eat a Dole Whip. 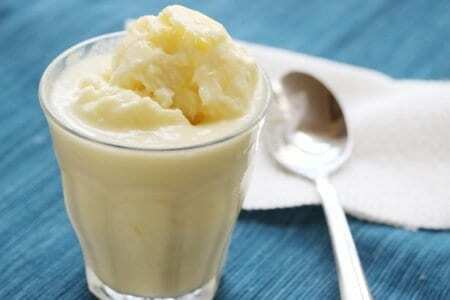 You can make one in your blender (affiliate link) with frozen pineapple and coconut milk. 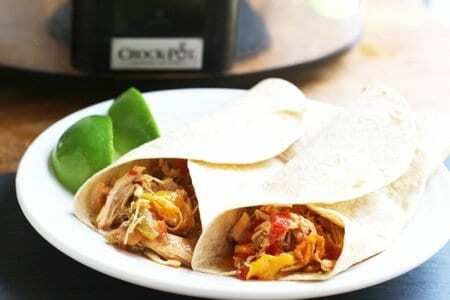 Slow Cooker Chicken Fajitas – This chicken fajita recipe is made in the slow cooker. I know it would be more fun if it was sizzling in a pan but I don’t always have time for that. Lemon Garlic Shrimp Scampi – Buttery, garlicky, lemony, peppery shrimp on orzo. Yum! 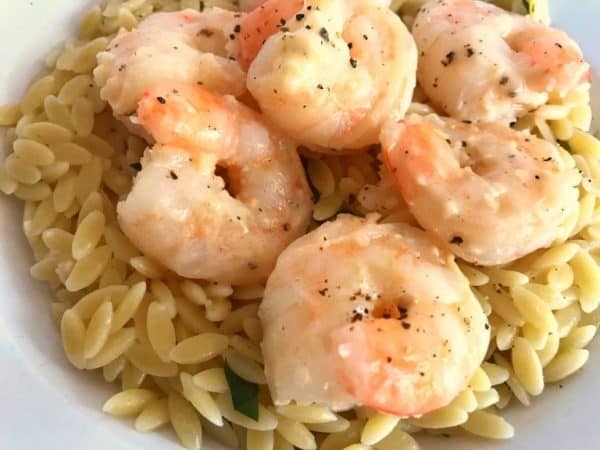 You’re going to love this Weight Watcher friendly shrimp scampi recipe. 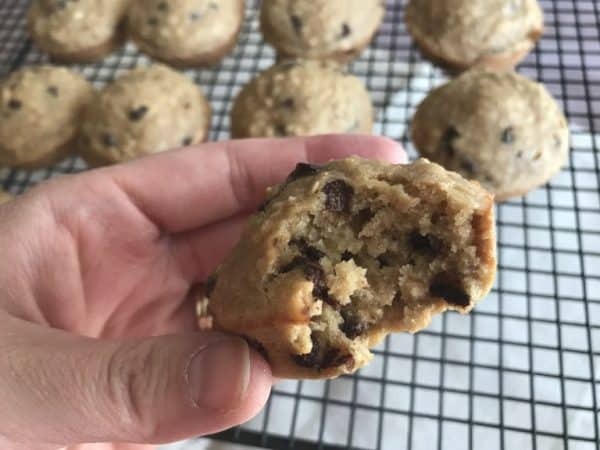 WW Friendly Cappuccino Oatmeal Chocolate Chip Muffins – These Cappuccino Chocolate Chip muffins are great for breakfast or dessert! By pairing down the amount of sugar, flour and oil and substituting those ingredients with lots of oats, applesauce, fat-free milk, and brewed coffee, you can enjoy 3 of these mini muffins for just 5 Weight Watcher smart points. 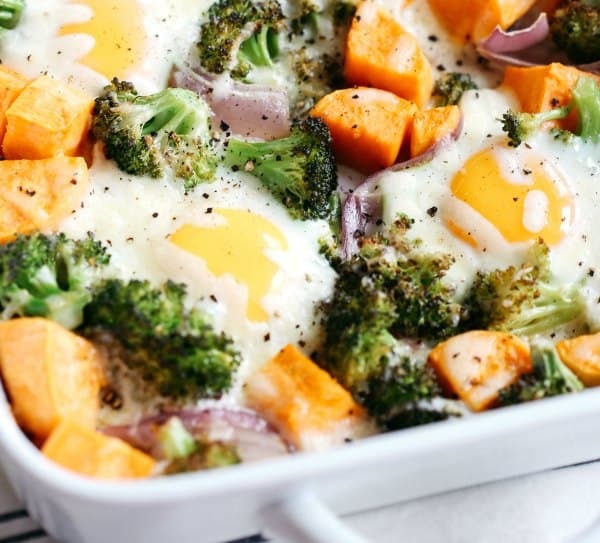 Baked Egg and Roasted Veggie Casserole – After a full week of meal prepping, I had a ton of leftover veggies that I wanted to use up so I thought why not roast them in a casserole dish (affiliate link) and throw some eggs on top! This dish is literally as simple as that. And it tastes so effortlessly delicious!! 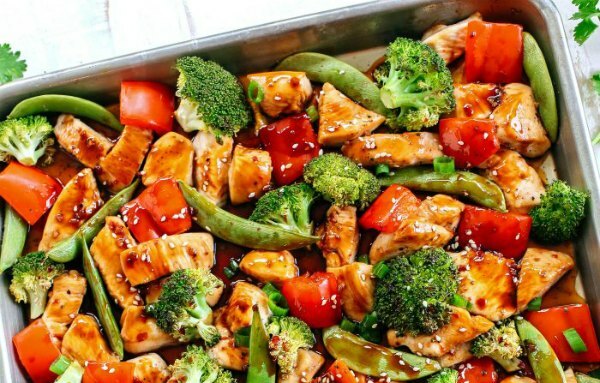 Sheet Pan Sesame Chicken and Veggies – This Sheet Pan Sesame Chicken and Veggies is one of my favorites because it’s a much healthier version of “take-out” that has half the calories, but ALL the flavor! You can easily prep this the day before too by chopping up all your veggies and marinating the chicken, but if this is a last minute recipe you decided to throw together in a pinch then that’s okay too. Prep time takes just a few minutes and the sauce only requires 5 simple ingredients so it really is that easy! Then just toss everything together on the pan and you are good to go. 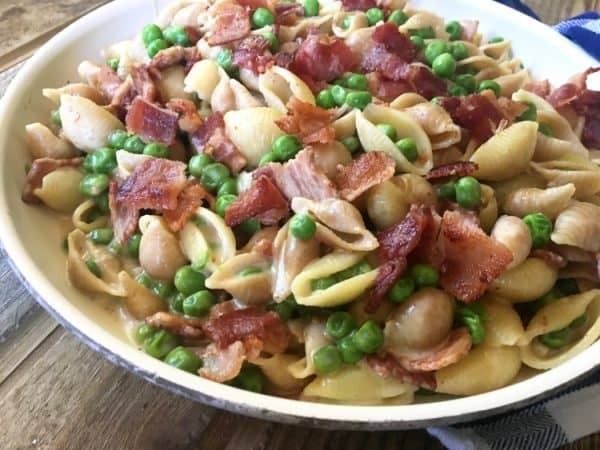 One Pot Alfredo Pasta with Bacon and Peas – It’s just so bright, colorful, and easy! This pasta comes together so quickly for me and after dinner, especially if I made everyone eat with their hands, I just have a handful of dishes to clean up which is one of the sweeter things in life. I love this meal so much. Since this is something I almost always have in the fridge lately. I’ll letcha know that I’ve also used it more as a side next to a delicious piece of grilled chicken or bulked up the protein by adding in a handful of already grilled or shredded chicken breast. I hope y’all enjoy. 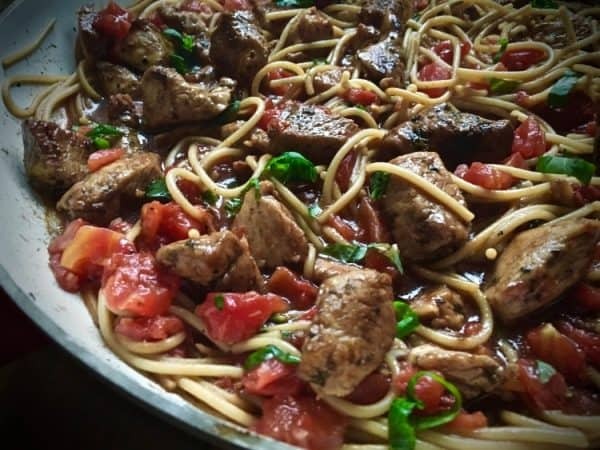 Balsamic Chicken & Bruschetta Pasta – One word: Delicious! If you like bruschetta, You will love this. I promise! Enjoy guys! 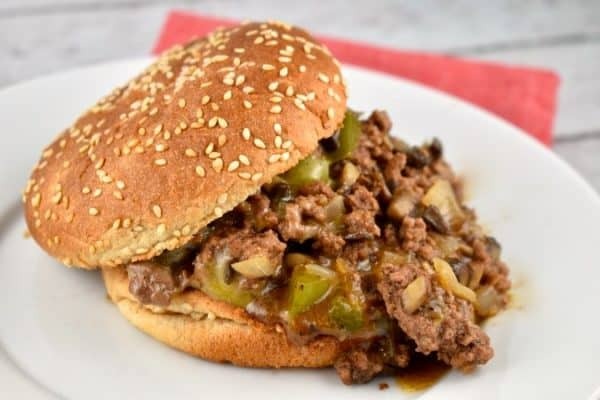 Philly Cheesesteak Sloppy Joes – A popular American sandwich takes the form of a favorite childhood dish in this tasty and easy recipe. It will have you falling in love with the Sloppy Joe concept all over again! 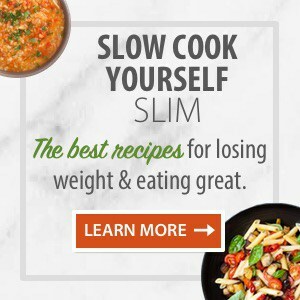 Skinny Slow Cooker Italian Pork Roast – As soon as I saw this easy, healthy slow cooker recipe I knew I was looking at a winner. I was right. 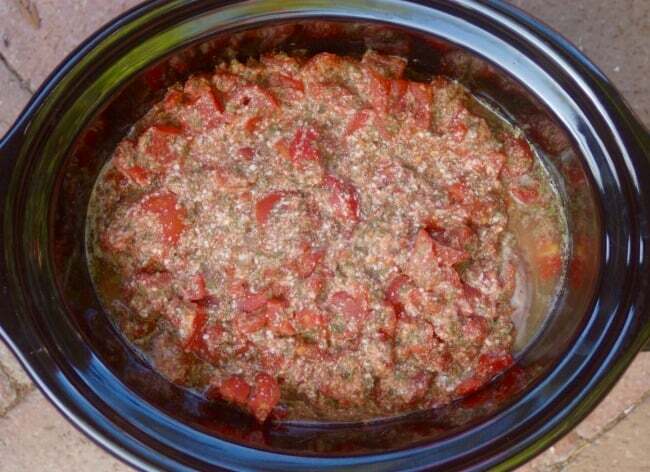 Lean pork simmered in tomatoes, Italian spices and Parmesan until fork tender. 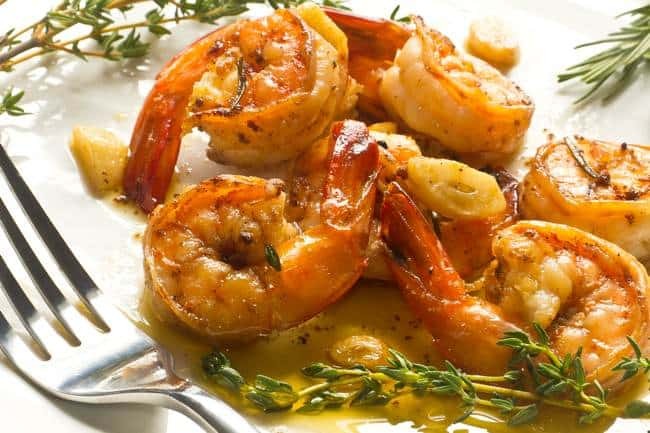 Shrimp with Garlic, Oil and Hot Peppers – A simple and beautiful dish from Patricia Wells Trattoria Cookbook, perfect for a busy weeknight dinner or more festive occasion. 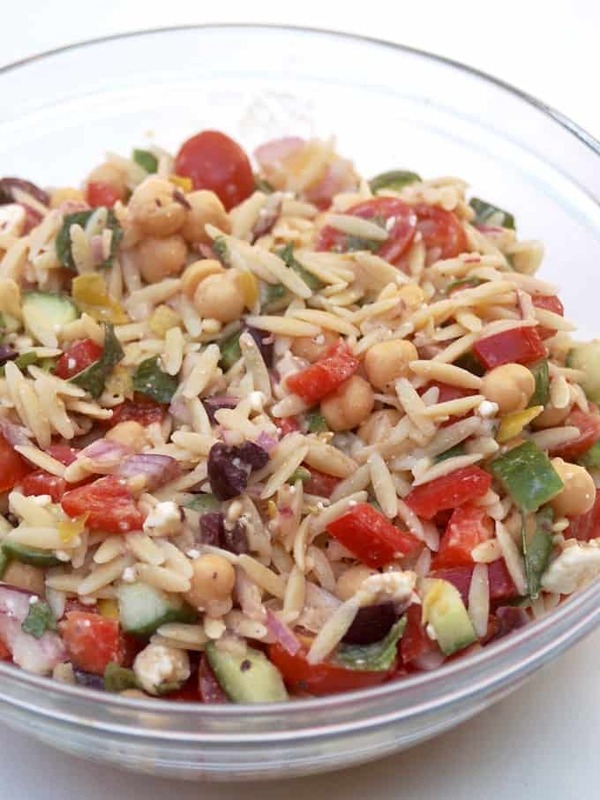 Trisha Yearwood Orzo Salad Made WW Friendly – Tangy and fresh this is a new favorite salad full of Mediterranean flavors I plan to make again and again and again. 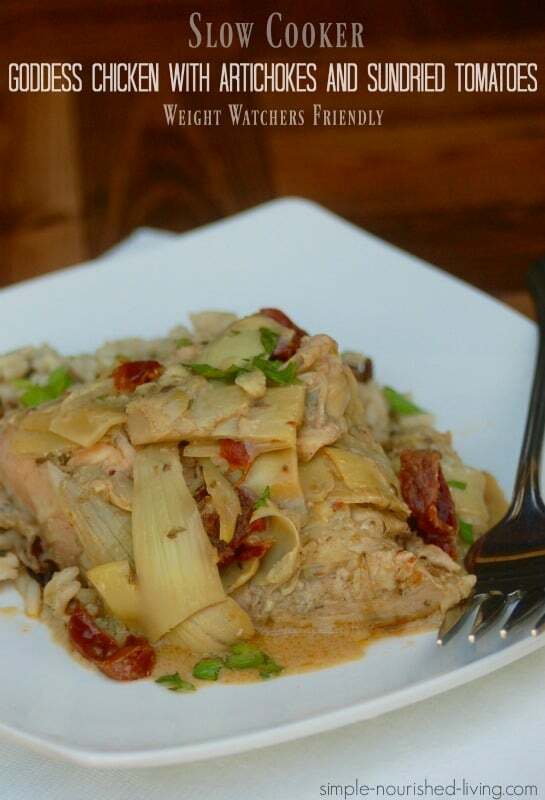 Skinny Slow Cooker 4-Ingredient Goddess Chicken – Simple and delicious with just 4 Ingredients this skinny slow cooker goddess chicken with sundried tomatoes and artichoke hearts is a winner with everyone who has tried it. 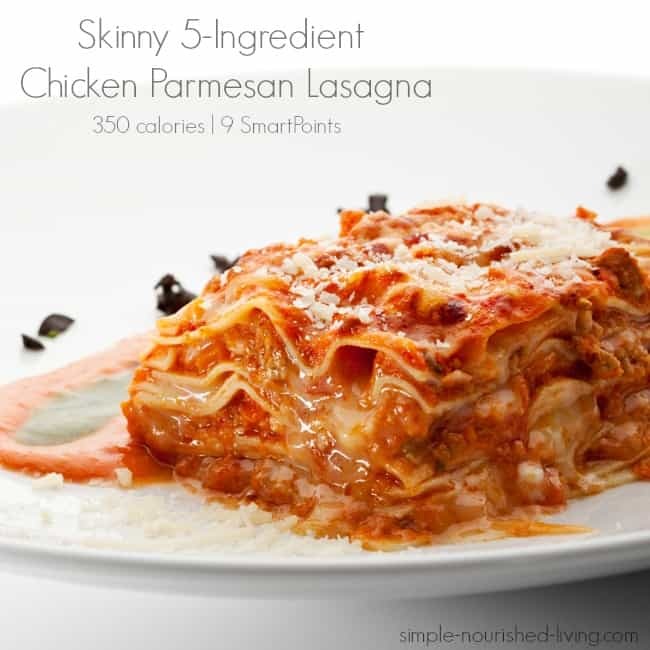 5-Ingredient Chicken Parmesan Lasagna – You only need 5 ingredients – no-boil noodles, jarred marinara sauce, ricotta, cheese, shredded mozzarella and rotisserie chicken to make this easy, healthy and delicious Chicken Parmesan Lasagna. 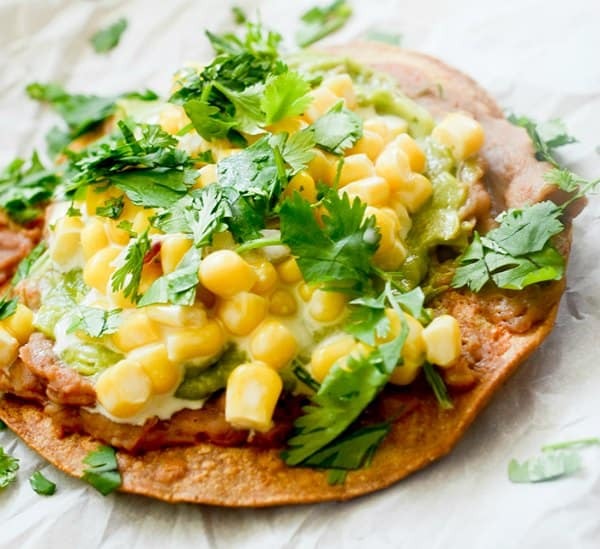 Mexican Street Corn Tostadas – Mexican street corn, avocado and refried beans atop crispy corn tortillas make for a perfect taco Tuesdays meal is less than 20 minutes. 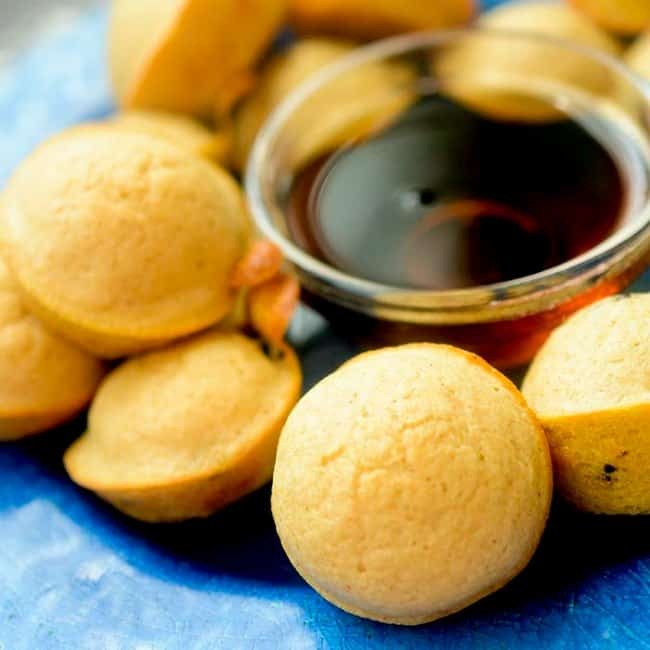 Easy Pancake Poppers – Bite-size pancake bites made from Kodiak cakes protein packed whole grain pancake mix makes for a fun and satisfying way to begin the day. 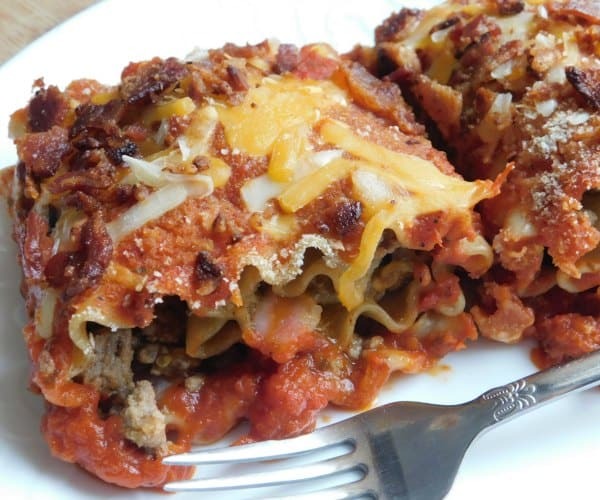 Bacon Cheeseburger Lasagna Rolls – These bacon cheeseburger rolls are delicious and so filling, such a easy meal to prepare for everyone and could easily become a new family favorite.. You can add in some extra “free” toppings as you wish, like pickles and mushrooms.. Recipe makes 8 rolls at 6 smart points each and they will freeze well too. 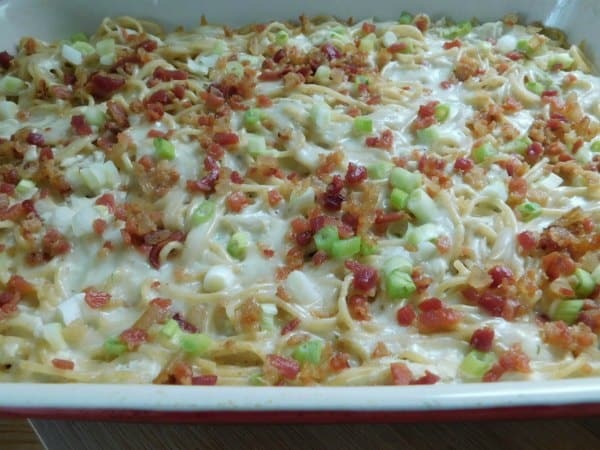 Chicken Ranch Spaghetti Bake – This dish is so full of flavor and I think the whole family will enjoy it. Skinny Cheeseburger Pot Pie – Love cheddar topped hamburgers? 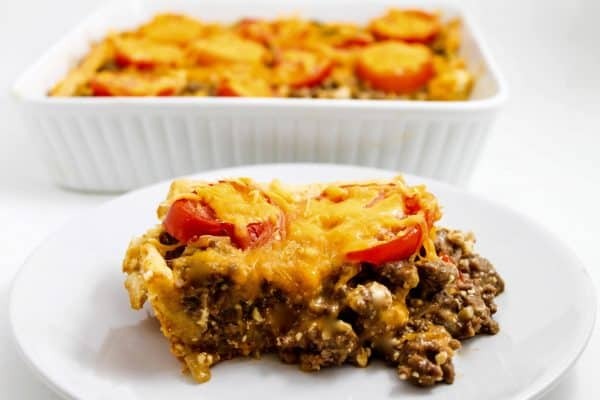 Think outside the bun with this yummy cheeseburger casserole baked in a flaky pie crust. It’s comfort food at its best! Makes an easy any night of the week dinner. 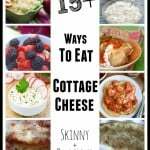 Previous Post: « Weight Watchers Weight Loss Success Story #41 – Linda N.
Once again, you’ve put together the most delectable list of recipes!Thank you so much for including my Skinny Cheeseburger Pot Pie. You are the sweetest. Wishing you all the best for a wonderfully delicious 2018. Martha, what do you mean when you say “All the recipes have Smart Points”? 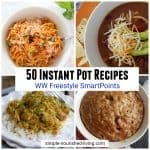 So far, the only ww recipe blogger I follow who is giving the old Smart Points count is Emily Bites. Everyone else has deleted the smart point count in favor of Freestyle points. I’m having to figure out the smart point counts by adding those zero point newbies back into the count, since Freestyle definitely isn’t working for me. I reached goal on Smart Points and have maintained until I tried the new plan. I’m going back to Smart Points. 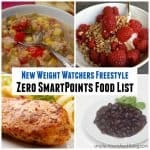 I wish the recipe bloggers would continue to list Smart Points like they do Points Plus. What a wonderful assortment of recipes; I can’t wait to try them. Thank You.